I've written about short-lived cereals before (Urkel-Os! ), but The Metal Misfit has a ton of archived posts about flash-in-the-pan breakfast cereals. He calls it Cereals from Beyond. --Dinky Donuts: TOTALLY illustrated by that guy who drew Bummers in Dynamite Magazine. --Croonchy Stars: Whaaaa? The Swedish Chef had a cereal? --Kaboom: With the rainbow clown. Kinda the generic sugary cereal of sugary cereals. The clown had no cartoon or other tie-in that I could see, so naturally he wasn't quite going to rise as high as Mr T cereal or C-3POs. --Morning Funnies cereal: Apparently the point was that they put comic strips on the box. Big whoop. --Cracker Jack had a cereal? 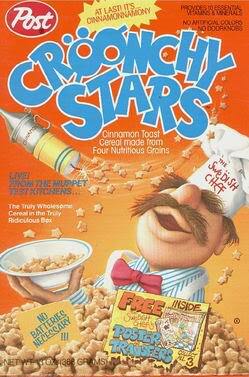 --Vanilly Crunch might be the only one of these cereals that I would regularly buy if it still existed. --Waffelos. Man, I can still remember how artificially maple these tasted. --Breakfast with Barbie. Holy. Crap. Fruity Yummy Mummy (and Fruit Brute) were the two monster cereals that never made it. And the mummy is so obnoxious in this ad you can see why. He should have been distinguished and with a clipped Egyptian accent, not sound like a small-time mobster from New Jersey. Man, I loved KA-BOOM. Wikipedia says it came out in 1969, which sounds about right to my memory, and that it was still available when the entry was written in 2009, though I have not seen it in stores for a good long time.